A good method for electrical energy storage or release is very essential for energy storage management system. Currently, electrical energy storage material mostly used super capacitor, lithium-ion, lithium iron phosphate or lead-acid battery. In order to correspond to different system voltages, batteries or super capacitors are often modularized in series and then connected in parallel, and multiple modules are connected in parallel according to system requirements. The microcontroller detects the voltage of each battery module and determines the charging or discharging mechanism of the power module to avoid battery module over-charging or over-discharging. After the battery module been charged or discharged repeatedly, the voltage could be unbalanced between each module, causing the storage capacity of the system is declining. If there is not managed or maintained immediately, it will reduce the lifespan of the energy storage module. Charge and discharge method can be roughly divided into three types. One is the Conventional Battery Charge and Discharge System, as shown in figure 1. This topology separate charging and dis-charging paths, may cause unbalance in the battery voltage between the modules. 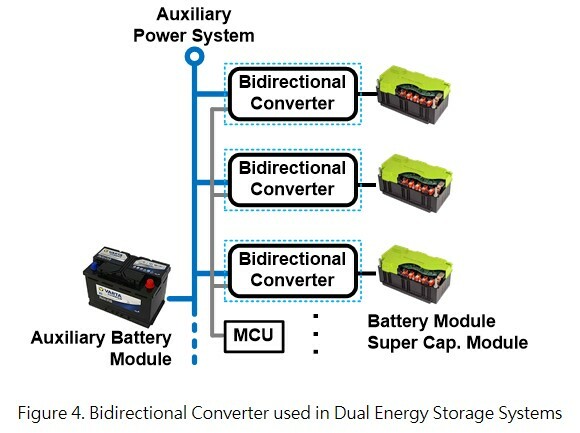 The second is Back-up Battery Charge and Discharge System with Bidirectional Converter (charger), as shown in figure 2. The advantage of this mode is that a single converter can achieve charging and discharging functions, which helps to reduce the overall space. The third type is Dual Source Battery Bidirectional Charge and Discharge Balancing System, as shown in figure 3. When the main battery is charging the secondary battery, it can be charged with constant current first and then charged with constant voltage later, vice versa. That is, the battery module with higher energy can be charged back to another battery module through the converter to achieve the purpose of balancing the power and avoid overcharging of the battery module. Bidirectional converter has been commonly used in Dual Power Systems or Energy Storage Systems. Figure 4 is the application block diagram of bidirectional converter. Microcontroller can detect the voltage level for each battery, when it's detected that the battery module is fully charged or the module voltage is higher than other module, microcontroller will send the control signal to bidirectional converter, and discharged the energy back to auxiliary power system, which can charge auxiliary battery or other battery modules. Transportation Applications in Renewable Energy used dual energy systems, such as hybrid vehicles, electric vehicles or marine. 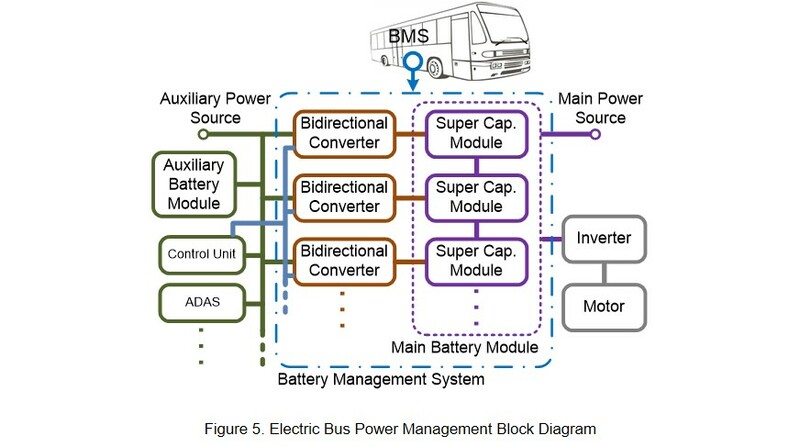 Figure 5 shows the power management for electric bus. of charge and discharge cycles, in the same super capacitor module, some capacitors still have residual energy, but some have been completely released, become an unbalanced status. Eventually, it will cause damage to the super capacitor module. Therefore, the bidirectional converter plays an important role in this situation. After the main power source has completed fast charging for whole super capacitor module, bidirectional converter can charge lower voltage modules individually. Higher voltage modules can feed power back to the auxiliary power system by bidirectional converter, avoid wasting energy. This method can balance the voltage of each module inside the super capacitor, extended the lifespan. 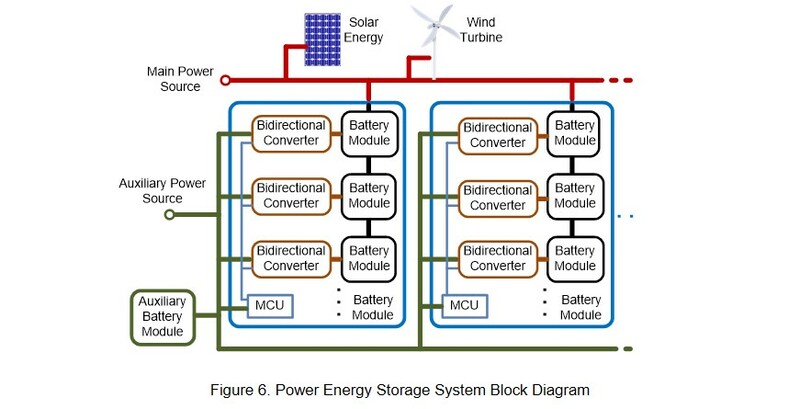 Battery Management System storing electrical energy through solar energy or wind turbine when off-peak electricity consumption. When it comes to peak electricity consumption, the stored energy is transmitted to the power system network via the inverter. Figure 6 is a schematic diagram of the energy management system. Through the bidirectional converter, higher voltage level battery modules can release energy to auxiliary systems to achieve energy recovery. Low voltage level module can be charged through auxiliary systems, reduce the voltage level difference between individual battery modules. This will extend the overall lifespan of the battery module.